Looks Good from the Back: Our Faces Are Exhausting. M: I had a weak moment at Sephora and bought a Beauty Blender. Meh. A: I don't use mine anymore, but maybe you will love it? I don't know. M: I used it this morning and I think I was expecting to look airbrushed, but I just look like I have makeup on. And my coverage isn't as good as it is with my favorite brush. Oh well. I may try using it for cream blush or something. A: I just felt like it sucked all my makeup into it and I had to use way more product. I just use my fingers now. M: I definitely had to use a little more product. I usually use 1.5 pumps of foundation and I had to use 2 and still felt like I needed more. A: I never found it the least bit magical but I was probably doing it wrong. M: I'll keep trying. I don't feel like I get a good finish with my fingers, at least not with the Smashbox foundation. This brush is the bessst. A: Oooh. I have to get a decent foundation brush one of these days. I will say, with the 17 step face washing and StriVectin, my skin has been looking MUCH better. M: Mine too! Ha, I originally wrote Wine, too! Now I want wine. But my skin is SO MUCH BETTER. I just still have old dark spots to cover up. A: I still have some dark spots but apparently washing my face like it's a Pinterest craft project is the way to go. Did you ever get the Avene water? M: I did not. Apparently I will do Anything For My Face, But I Won't Do That. But! I have a hot tip! A: Snort. PLS WITH HOT TIP. IS IT WINE? M: Okay! 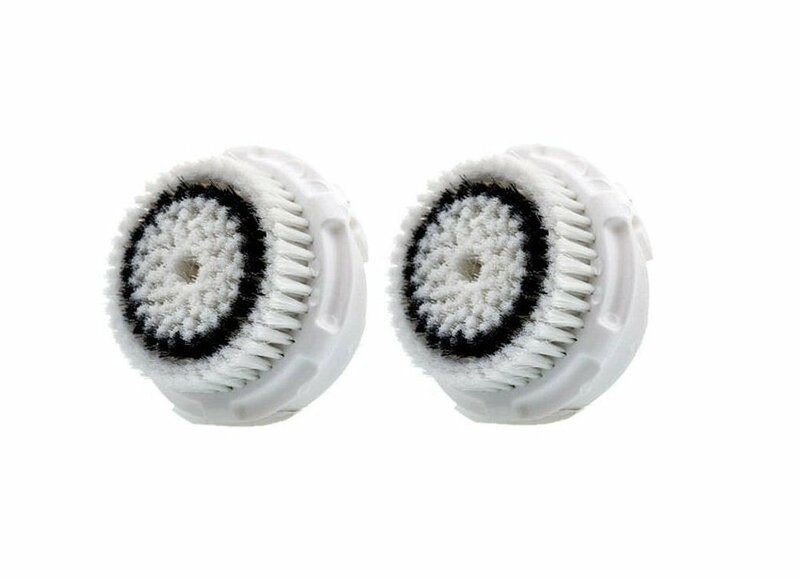 My friend A'Dell told me she bought these generic Clarisonic heads of Amazon and they are EXCELLENT and $6 a pop. A: Whoa, I didn't even know there was such a thing as generic Clarisonic heads. Maybe I'd actually use the damn thing again. M: I use it every night as part of my own ridiculous skin care routine, those sensitive heads are really soft. A: I've just been using a washcloth like the bossy British lady told me to. Apply DHC cleansing oil (thank you AGAIN, I love it and the tiny bottle goes a long way), rub all over face and eyelids. Dampen my hands with warm water and work into the oil. Wet a washcloth in very warm water, wring out, and place on my face to steam off all the crap. Apply cream cleanser (I ran out of my Image Vital C Cleanser and I've just been using Cerave, it's fine). Pat dry for god's sake. Don't get me started on moisturizers. A: Isn’t the DHC stuff great? That's about what I've been doing except without the Clarisonic. I also spray some fancy canned water on my face, dry AGAIN and then put on a million layers of stuff. I got a deluxe sample of this Caudalie Serum and ooooh, I like it. M: I am using zero serums because I am paralyzed by all the choices. I did buy some new eye cream and it's good, and on sale. A: I’m still digging my Boots No7 eye cream. As for the serums, I just slap it all on and hope for the best. I don't even care what the hell it does as long as it makes things better. Related: I'm tired. The Avene water came in my ipsy bag, but I have zero idea what I'm supposed to do with it. I spray it on after I wash my face, but before I put on serums/moisturizer, etc. It's not just water - it's supposedly got trace minerals and healing properties. I think it is just cleaner and less harsh that tap water. Generic Clarisonic brushes are my favorite find of 2014 so far. WOO! I obviously am not doing skincare right. You guys are going to think I'm so gross but I hardly wash my face... like twice a week I'll actually use a face wash. The rest of the time I just use L'Oreal's Hydrafresh toner on a cotton pad in the morning and when I get home. Once a week I do the whole shebang w/ a biore nose strip, a mask or scrub and totally remove all my superglue eyeliner and start fresh. It's crazy but it works for me. Oh and those blenders are great for blurring after applying with fingers/brush but lord they soak up so much foundation when used as an applicator. And guys... water in a can rules. GIRL. I hate to be a jerk but you're gonna end up paying for that down the road. At the very least, remove your eye makeup completely every night! An eye infection is no joke. Well, thanks to you introducing me to Caroline Hirons I too am on the skincare wagon, with Alpha-H and serums and all. It's like clogs all over again. Are you using the beauty blender wet? I think I heard somewhere that you are supposed to run it under water so that it expands and then use it. Maybe that would make it absorb/waste less product? I am! I think it's just not giving me as much coverage as I prefer. I am too! Here's what's been working better for me. One pump of foundation applied with my fingers. Then a half pump which I apply in a stippling manner with the sponge. It kind of smooths out my foundation and makes for a nicer surface overall. And, I don't feel like I'm wasting product.